Drivers in the Fort Lauderdale area have many options if they need body work or paint work completed on their car. There are many independent body shops that will happily work on your car. However, there’s no way to know whether or not these shops have properly certified technicians. At Vista BMW Coconut Creek, all of our techs are factory-trained and certified. Our collision center is also BMW factory-authorized. In fact, our collision center is authorized by all major car brands. We’ll be happy to work on all BMW models, and we’ll work on vehicles from other manufacturers as well. We have nearly a decade serving the drivers of South Florida, during which time we’ve worked on numerous vehicles from all major manufacturers. The collision center at Vista BMW Coconut Creek even offers a limited lifetime guarantee on all of our work. If you want to learn more about what sets us apart, come into our Fort Lauderdale area BMW dealership today. Here at Vista BMW Coconut Creek, you have more than just our word to guarantee our auto repair work and bodywork. Our bodywork is protected by a limited lifetime guarantee on all paint, workmanship, and materials for as long as you own or lease your vehicle. Compare this to the vast majority of body shops that will simply try to convince you that their work is of high quality. If you’re in Boca Raton, Coral Springs, Delray Beach or elsewhere in the Fort Lauderdale area and you want to give your vehicle guaranteed quality care, bring it into the Vista BMW dealer in Coconut Creek today. If you’re thinking about taking your beloved car to our collision center, you’re no doubt interested in our credentials. 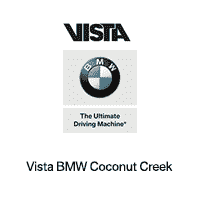 Vista BMW Coconut Creek is a BMW factory-authorized collision center. This means that we have to maintain a very high set of standards. All of our individual technicians are BMW factory-trained and certified. Our techs are also certified by many prestigious third-party organizations. They love working on BMW vehicles, but our technicians are happy to work on all other vehicles. Vista BMW Coconut Creek has an established relationship with all of the most popular automotive insurance companies. We have direct repair agreements with all of the most popular insurance companies. To put it simply, this means that there is very little paperwork for you to do. We’ll take care of most of the hassle and paperwork. Getting your insurance company to cover repairs and bodywork can be a real pain, so our guests are always happy to have us do it for them. As a certified and authorized repair center, we only perform legitimate fully documented repairs. If you have a vehicle from another manufacturer or a BMW in Fort Lauderdale, bring it in and we’ll work with your insurance company.